Are you purchasing new equipment to help you deliver a better service and help elevate the practice profile? As you know, the purchase is only the beginning. Aside from training, you need to consider promotion and implementation of the processes. What internal and external marketing will need to be done? How will you get your staff to buy into the new processes? Will patients see the benefits? If these areas are not carefully thought out and planned, costly missed opportunities will occur. There are effective ways to successfully market new equipment and technology to prospective and current patients. Before marketing can occur, every team member must know how the practice and patients will benefit. It is necessary to research, evaluate and become aware of the value new technology has to offer. We know that when new equipment is properly utilized, it can help teams become more efficient, more effective and deliver better patient care. Before we can discuss how you will successfully market your new equipment to patients, you must lay the foundation. Start by introducing prospective technology and equipment to the staff. Learn the benefits of the equipment, proper utilization, receive training, research marketing opportunities and learn verbal skills that you and your team will use to promote the new technology. Prior to making an equipment purchase, recruit your team to help with the research process. Have them gather information and learn ways to incorporate the equipment. Share your vision and desired outcome with them. Get them excited about the new technology and as a team, share the ways it will help the practice and more importantly, the patients. Without a doubt, including your staff in the process will allow you to get the most out of your investment. "Why do we have to do this?" "This sounds like a lot of trouble." "We already have a nice practice. Patients love us." "I like the old way better"
"Can't we do it like we always have?" Not every person in the practice will resist, so recruit the ones that are excited to help you move forward. The others will join as they start to see the results and start to feel more comfortable. Negativity could prevent you from successfully implementing new equipment. If they don't buy in, neither will your patients. Know that every person in your practice will be responsible for promotion, presentation and patient acceptance. Keep in mind, people will only buy into a new idea when they see the benefits. When employees first hear about the new equipment, they might think about the workload they already have and sometimes translate "change" to "more work." If they are not tech savvy, they might resist as well. Know these indicators from the beginning. While consulting hundreds of practices over the years, we see equipment sitting in the corner gathering dust or not being utilized enough or properly. The common denominator in these practices is that the doctor did not involve the team in the implementation. A staff might say, "Oh, he bought that at a dental meeting and it just sits there," totally unaware of the benefits and missed opportunities. As you start discussing how the new equipment will benefit the practice and team members' individual jobs, you will see them brighten up. This is the first step to acceptance and reaping the rewards of your investment. You will have your entire team promoting with you. This will be the most important step in marketing new equipment and new technology to your patients. Continue to establish the benefits of the equipment. How can it help your practice and benefit your patients? Once you establish benefits and your team is on board, start spreading the word in your internal and external marketing efforts. Include descriptions and benefits of the new equipment on your Web site, in newsletters, social networking sites and practice brochures. Your marketing should educate patients about your equipment, but should keep in mind they are not dental professionals. They will be more interested in something like, "We have implemented all of the latest comforts and technologies in order to make your visits as pleasant as possible" versus "Our new laser works well on soft tissue procedures." Being on the cutting edge of technology helps you to gain the interest of the patient. They soon learn that this new equipment improves the delivery of dentistry and the quality of care. Staying current and being perceived as up-to-date is important. Your team will be more interested in their jobs and the practice as they see the patients respond to the technology. For example, digital radiography gives us instant X-rays and reduces a patient's exposure to radiation as much as 90 percent over traditional X-rays. When the staff informs the patients of the advantages and they actually see the X-rays pop up instantly on the monitor, they are pleasantly surprised. Another example is the use of CAD/CAM. Patients have had to come in for two visits when they needed a crown. It is no longer necessary. They are surprised when they learn that their crown procedure can be done in one visit. Most patients dread wearing a temporary crown and the CAD/CAM eliminates the need. We see treatment acceptance increase when these two benefits are shared with the patients. State of the art technology is an investment. You can use the benefits of owning this equipment to help attract and retain patients. The fact that you are focused on delivering optimal care will be transparent to your patients. As you are promoting your new equipment, use the number-one patient objection to dental treatment to work in your favor. That objection is fear. Mention that most new equipment has made routine dentistry more comfortable, easier and a lot faster. Many local television stations and newspapers may be interested in running a short segment or press release on new procedures, especially if you are the first in your area to have it. One example would be air abrasion. People are talking about the possibility of receiving treatment without needles or drilling. Hard tissue lasers fall into the category as well. 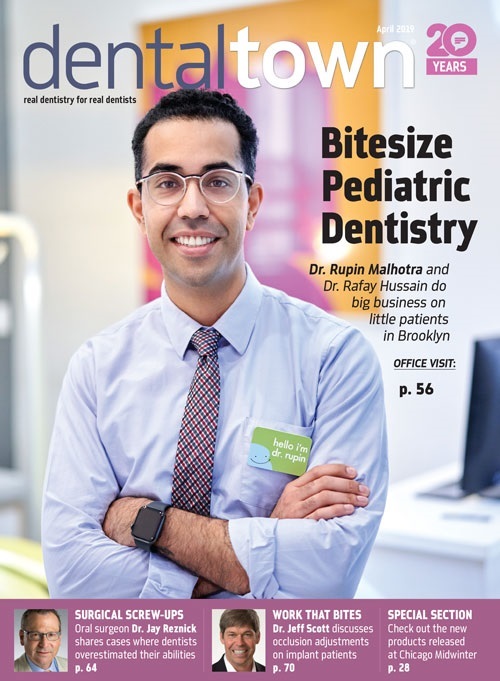 Contact local news agencies and local publications and make them aware of the new equipment in your practice and its potential to improve dental health and patient experience. They will be impressed if you share the technology and how it helps you deliver a better service. Marketing your new equipment will produce the best results if it is done internally as well as externally. Capture the patient's interest with conversation about the equipment when you are face to face in the practice. You want to educate and motivate. Make sure the entire team is sending the same message and knows how to promote and answer questions. Share this article and start a customized list of successful communication created by you and your team. Let your patients know that you have this technology available to them and not every practice does. "The procedure for crowns is so much easier. There's no need for impressions taken with gooey material like before. You don't have to wear a temporary crown and since the technology is so precise, you conserve a greater portion of your natural tooth." "We are proud to offer the latest technology of being able to produce a crown for our patients in about one hour – in a single visit!" "This technology allows us to offer natural looking, high quality ceramic restorations, completed and placed in your mouth in a single visit, saving you a lot of time." "It's a very thin camera that gives us a 'tour' of your mouth on a TV screen. We can even print out a picture of your broken tooth. We want you to be informed at every step of your treatment." "With this camera you can see what we see." "Lasers are a precise and effective way to perform many dental procedures." "Laser dentistry oftentimes minimizes bleeding." "The laser uses a sensitive beam of light to remove unwanted tissue with very little discomfort." "We offer the latest, most precise, diagnostic tool. Using an electronic laser light system it helps us find even the smallest area of concern. These areas would otherwise go undetected until they are larger, cost more and become more complicated." "A large percentage of tooth decay can go undetected with traditional dental techniques like probing and X-rays." "This system is painless and will help preserve your teeth by finding potential problems early on." "This type of X-ray is instant, efficient and more comfortable for you." "We are reducing your exposure to radiation by as much as 90 percent over traditional X-rays." "Digital X-rays do not require chemicals so they are better for you and the environment." "We can change the contrast to better examine discrepancies." "Air Abrasion is great for removing old white fillings because it does it more conservatively than the drill." "The machine removes decay without the need of noisy drills or anesthesia, in many cases." "The procedure is a lot faster with this technology." "It will allow us to pinpoint a small area of decay without having to unnecessarily compromise tooth structure." Whether you are considering a purchase or currently implementing new technology, know that your staff will be a key component in gaining patients' acceptance. You and your team will make the implementation of innovative technological resources a success. It will be more important now, than ever before to attract and employ high caliber staff. Utilize your staff to create an innovative environment that renews office enthusiasm. When properly incorporated, the return on investment for new technology is higher profits, efficiency and marketability.